If I were a genius, I would design a credit card with no rewards, an account set up fee of $29, a program fee of $95, an annual fee of $48, and a monthly servicing fee of $84. Then I would booger glue a fake credit card onto the paper, call it “WaMu” for whatever reason, and send it to a geek named Josh. That way he would write about it on his blog and my card would be famous. I’ve always wanted to be famous, and while you shouldn’t start worshiping the ground that I walk on just yet, you might start by worshiping the chair that I sit in. 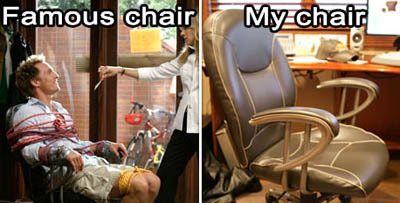 As a matter of fact, my chair starred in the movie Failure to Launch. I’m very happy for my chair, but I have to admit it’s a little disheartening that my office chair is more famous than I am. I always wanted to be famous, but I never thought it would hit me quite this hard. As I walked into the hospital, I thought I would have some fun with the receptionist, so I was like, “Um…I kind of…got hit by a car.” I was sort of expecting the usual wide-eyed, dropped-jaw response, but instead what I got was, “Hey, you’re the guy that got hit by that midget car in the parade, aren’t you?” Apparently news travels faster than a guy limping to the hospital. I was watching the Butterfest parade, and when the guys driving the little midget cars came by I was like, “ooo, I want one!” Little did I know that one would indeed end up in my lap. Apparently the steering column broke, pointing the car full speed in my direction. I was left with little more than a bruised foot, but you shoulda seen the divot he left in the ground. The head dude of the organization called me later to make sure that I was okay. He was like, “Those things are bound to happen,” and he didn’t even offer to pay for my x-ray. In baseball, if somebody gets hit by the ball they get to keep the ball. The way I see it, that car should be mine. If you’re one of the many hopeless romantics with a crush on the famous Josh Meyer, then rest easy because there may still be hope for you yet. With an almost innumerable flock of those deathly attracted to him, Josh has become simply overwhelmed by the number of girls telling him of their or someone else’s feelings for him. Starting this fall is an all new series of The Bachelor, with who else but Josh Meyer himself to select one lucky bachelorette from the countless applicants. Josh, a self-described unsociable “geek,” has long cherished his carefree bachelor lifestyle. However, amongst the infinite hopefuls, is there one girl who can stop Josh in his tracks and inspire him to settle down? Don’t wait any longer; send in your application to bachelor@photricity.com, along with a top-ten list of why he should select you and as much information about yourself as possible. Good luck, you’re going to need it.